Are you trying to curate a good drink selection for your restaurant, cafe, or bar? If so, you will need a good menu that will allow you to list out the names of the unique drinks or drink mixes that you can offer to your customers. 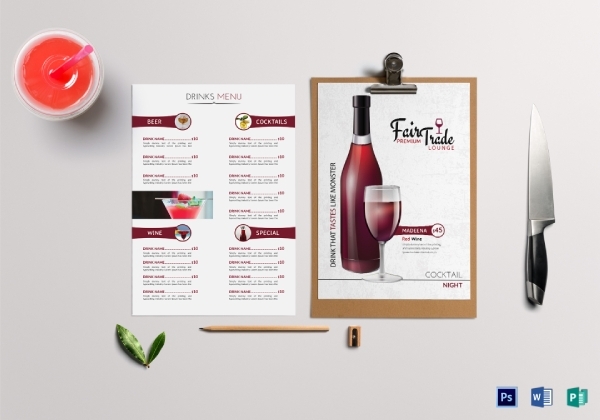 To help give you a good head start, drink menu templates that you can download and creative examples you can take inspiration from are provided in this article. It is quite common for restaurants, cafes, etc. to serve food along with the perfect drink. Some even offer packages that include one dish and a drink for a reasonable price. Doing this for your business can only help you rack up revenue especially when it is planned out and executed properly. With that in mind, it is important to provide a menu to the customers to present all the food and drinks you have in store to help them decide what to order. According to history, beer has been around since 5,000 BC. It was used by ancient Egyptians for religious ceremonies. With such a long running history, it is no wonder that this drink has become one of the people’s favorite alcoholic beverages. There are quite a few bars and pubs that offer various types of beers that will surely excite an alcohol and beer enthusiast. 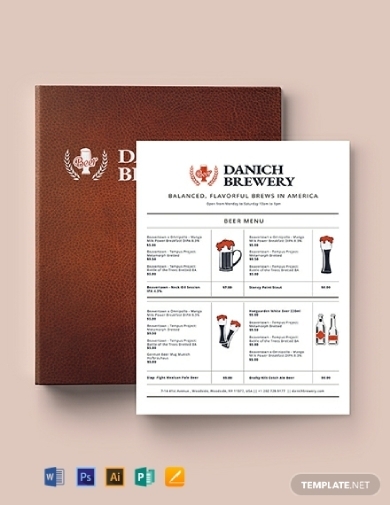 If you are looking for the perfect beer menu template, you can download and edit this template. Your drink menu should showcase all the available drinks that you offer to give customers a clear overview of what to expect. Hence, your drink menu should not only be clear, but it should also exude the vibe your establishment is going for. 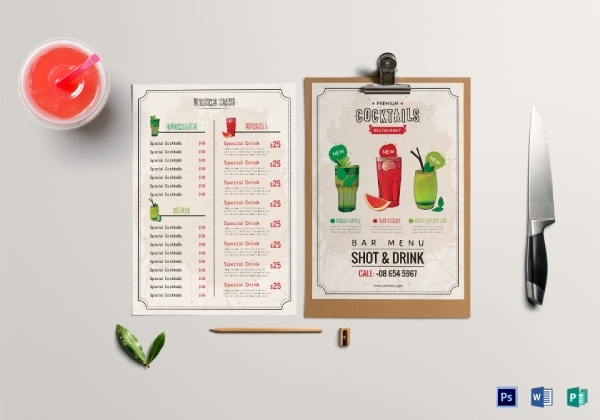 If you want to use a well-made drinks menu template, you can download this one to make use of its high-quality designs, clear format, and original artworks. You can easily edit this template to incorporate your preferences. Cocktails are alcoholic mixed drinks; while some have a strong alcoholic punch, others are mixed just for chill drinking. 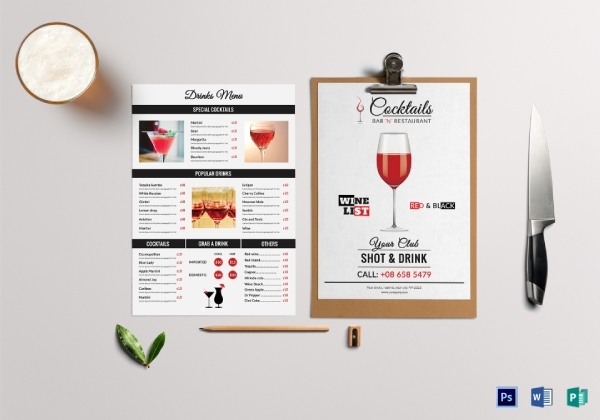 If your business focuses on serving cocktail drinks instead of single or bottled drinks, then you should have a well-designed cocktail drinks menu. To help you out, you can download this high-quality template that uses original artworks, unique designs, and flexible layout that you can easily customize to suit your vibe and preferences. Nothing is more comforting than the strong, soothing smell of coffee wafting through a cafe. For coffee lovers, coffee is their fuel; it helps them function normally on a daily basis. 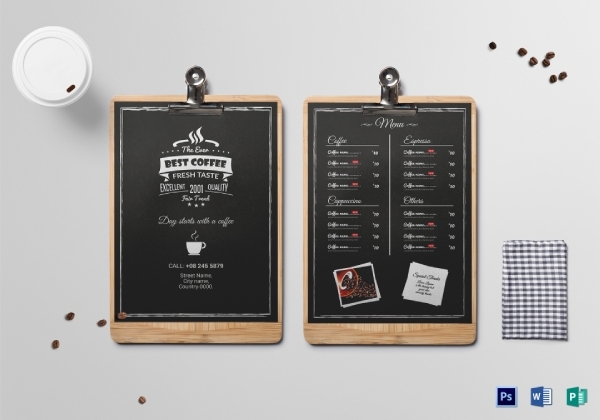 In order to entice coffee lovers to check out your business, you should have a menu that not only is aesthetically pleasing but also features good brews that will excite them. You can download this coffee menu template to present all the unique house brews for your customers to see. A classy and elegant restaurant or cafe deserves to have a luxurious menu. In that sense, your drink menu should also exude class with the way it is designed. To help you achieve that, you can download this luxurious drink menu template to make use and enjoy its intricate illustrations, high-quality designs, clear layout, and so much more. You can easily edit this template in Adobe Photoshop, and MS Word and Publisher so that your own details can be incorporated. Bars offer a wide variety of drinks to their customers; however, in order to convey that to customers, there should be a menu that presents those options. Your bar drink menu should be creative and consistent with the overall theme of the bar itself. 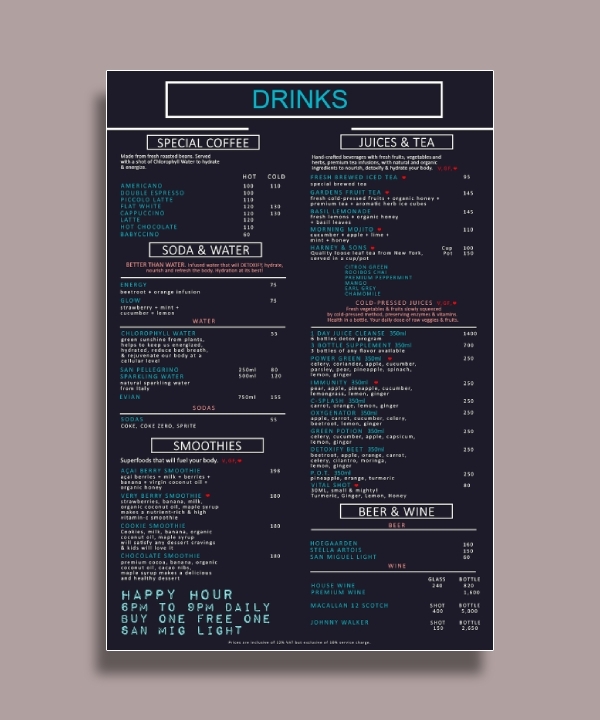 In this sense, you can download this bar drink menu template to get a good head start when you start to curate a menu. 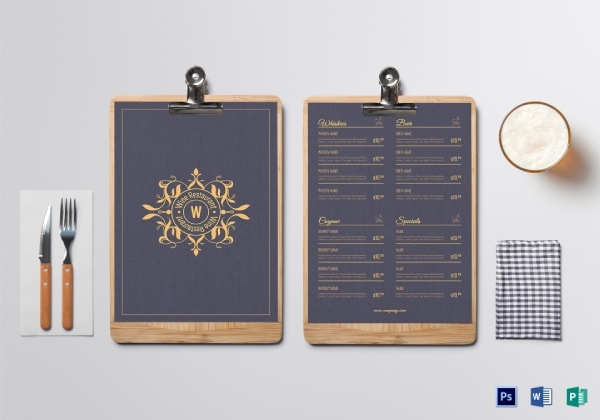 This well-designed menu will allow you to include sufficient details without sacrificing the overall appearance. More than just featuring a wide selection of wine that you offer along with the serving sizes and price, your wine menu should also be creative and aesthetically pleasing. 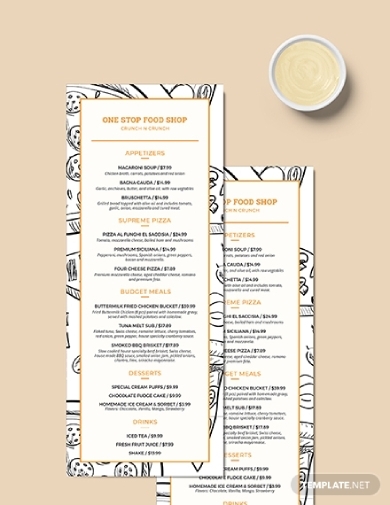 In that sense, your menu should use unique designs and illustrations, and a clear layout that will allow you to emphasize and highlight its contents. 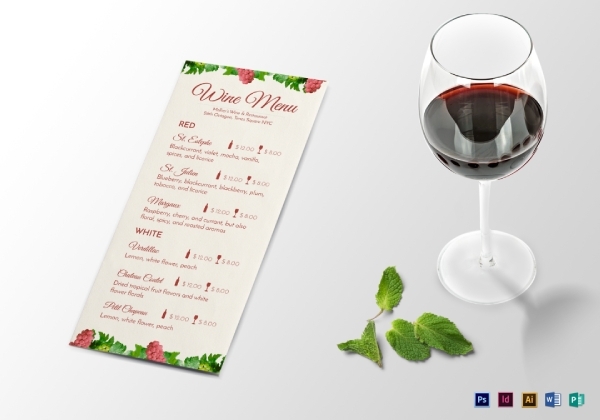 With that, this wine drink menu template is perfect for you. It uses unique designs and original artworks that you can enjoy when you download this template. Summer is the perfect time to drink, lounge, and have some fun under the sun. As a business establishment, you should use that season as leverage to release season exclusive drinks to parch everyone’s thirst. Your summer cocktail menu should use summer-related designs and illustrations to be consistent with your theme and it should also have a clear format so that customers can easily understand the contents. 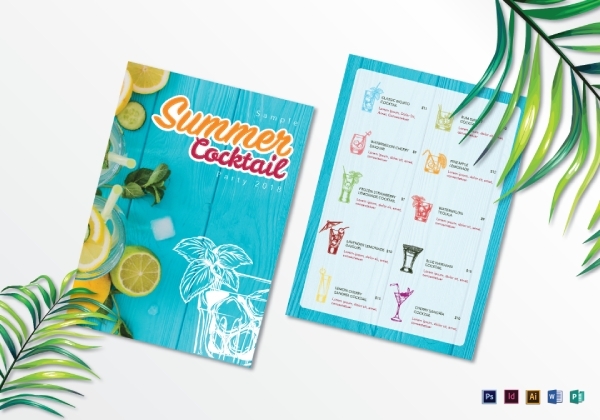 You can download this template to achieve a total summer vibe with your special menu. It is quite common nowadays to incorporate neon-colored lights in designs and illustration. And as you can see, it is the perfect vibe for a bar, club, or pub menu. Neon light-inspired font colors look good against a black background; it will make your menu look rad and will surely appeal to your target customers. Take inspiration with how the font colors, font style, and overall vibe complement each other in order to achieve a fun and popping menu. Fruit juices will never run out of style regardless of the countless innovations when it comes to drink-mixing. It will always provide comfort to people. Aside from that, it also provides high nutritional values to people who drink it. 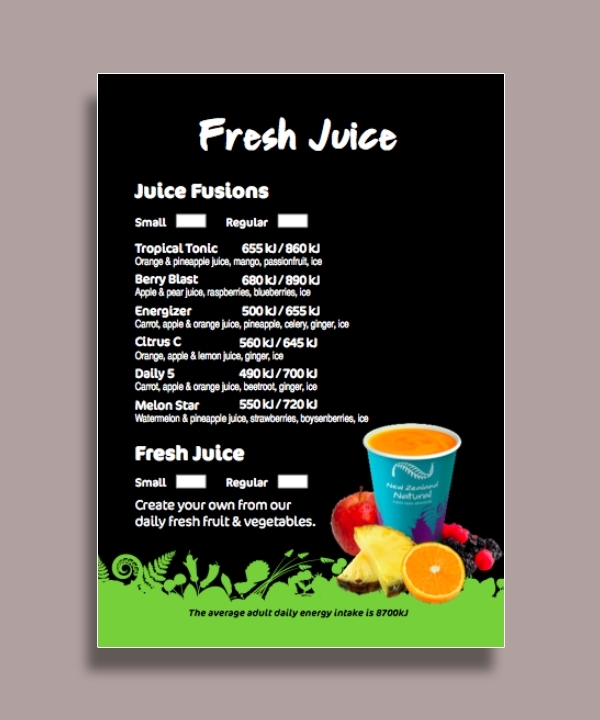 In order to promote your fresh fruit juice drink business, you should have a menu that appeals to the masses; be unique with your products but still use common ingredients. In addition, you should use high-quality designs, illustrations, and layout to add more appeal to your menu.